I have 10 different ideas on how I want to set up my breeding tanks. I would like to see some photos of what people have already done successfully so I can narrow down my ideas. My initial setup to practice breeding will be a 30 gallon standard for the pair, a 10 gallon for the larvae, and a 20 gallon for the grow out. All 3 I currently have. My short term goal after a few successful 30 day hatches is to set up a system that will allow me to harvest and grow out a batch once a month so I have a steady, but manageable monthly supply. I figure keep the original 30 so as not to disturb the breeding pair, then set up a rack system of 2 larvae tanks around 5 gallons (10 split) and 3 10 gallon growout tanks, and 3 20 gallon growouts. For simplicity, I think I will plumb them all together and share a sump and refugium with skimmer, heaters, and uv's etc... I'm trying to minmize the initial costs and add to it when I need it, so i need a little fexibility. I really just want to see what other hobbyists/small breeders have done so I dont reinvent the wheel, or not think of your best ideas ever Thank you in advance for your help. I guess setups are TOP SECRET. I can wing it with empty soap bottles, galvanized troughs, and copper pipes. there has never been alot of system pictures as they, i suspect are a bit on the secret side. What sort of space and proposed setup are you thinking of. break it down into points and ill make some suggestions. eldouble wrote: I guess setups are TOP SECRET. I can wing it with empty soap bottles, galvanized troughs, and copper pipes. My setup is not top secret, just always a mess. Construction is slow and always in the way. I have, however posted some pics on other threads. Will try to drag some here. Here is part of my growout system. The small bottle on the left front upright is my artemia starter. Top row is for greenwater and small juveniles. The round fish bowl has been modified as an egg tumbler. Slow the bubbling and it keeps fry of smaller species in the middle of the tank along with the food. Bottom row is for intermediate growout. Yes Kathy, I use PVC gutter for return. 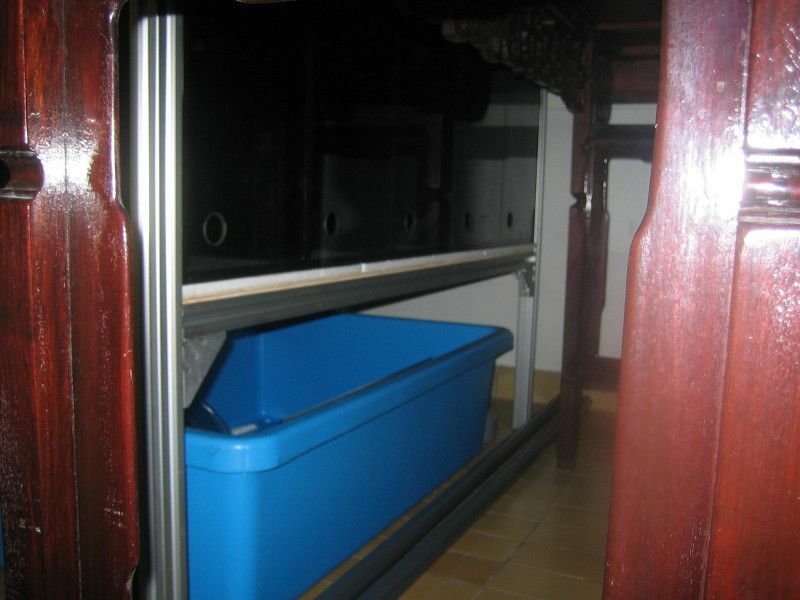 I can screen the drain, clean tanks into the gutter and retreive the fish that escape through the siphon easily. Also makes for easy cleaning of the return. The system sump utilizes a particle filter over a biowheel (old tidepool parts. Heater and return pumps to the right. Oh! Also, I used standard 2x4 stud lumber for construction and standard steel lag screws. Note that each junction point on the rack is braced in 3 directions, keeping the rack square (even under a load) and maximizing strength of the structure. HERE"S ours. You'll find it in the "Hardware" forum. I guess setups are TOP SECRET. Thanks everyone for the pics and the links. I now have a few ideas to work with. Im currently feeding my new B&W 'pair' to get them beefed up and growing faster. They are playing well together in my office 10gal while the new 30 gal set up at the house cycles. Plus here I can feed them every hour. They are getting curious of the BTA in the tank, so I may have to transplant that also. Hopefully by Feb or Mar they will start their love nest, so I have time to build a decent little set up. The vendor links are good too, as I would have never found those plastic valves. The tight pics are for a reason. Utter wreck behind, above, below and both sides of the camera. 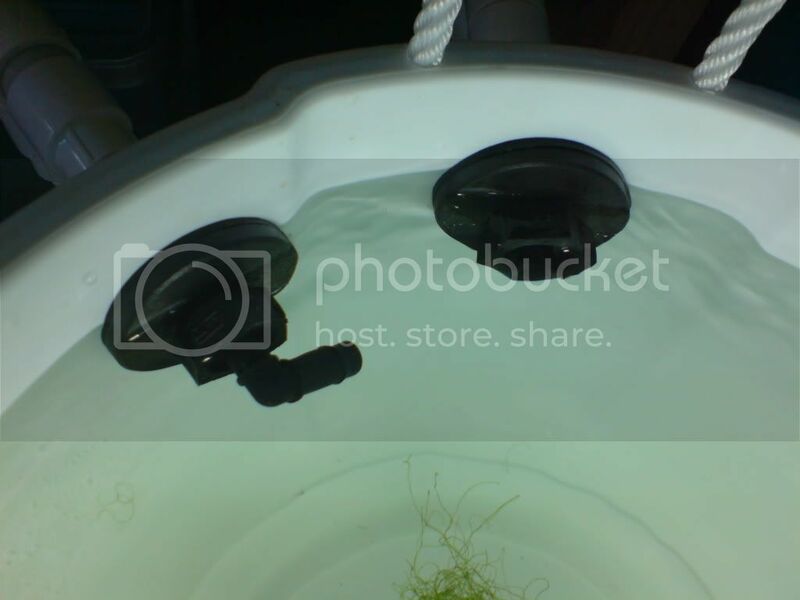 Is anyone using a refugium for macro algae or/with a deep sand bed. I have a fuge on my 90 gallon reef tank, for nutrient export along with a skimmer. I still have to do weekly water changes due to fish load. I see this being 10 times worse as ar as nitrate issues. Im steadily at 30 right now, but with 1000 hungry kids, I would guess nitrates should hit the roof. I understand fish can handle higer nitrates than inverts and corals, but I still think 100 is way to high. How does everyone handle nitrate removal? I use alage scrubbers, work like a charm. More practically you could use something like those de nitrafiers than aquamedic produce, the sulphur ones are super efficient but do require a bit of gear to make work well. 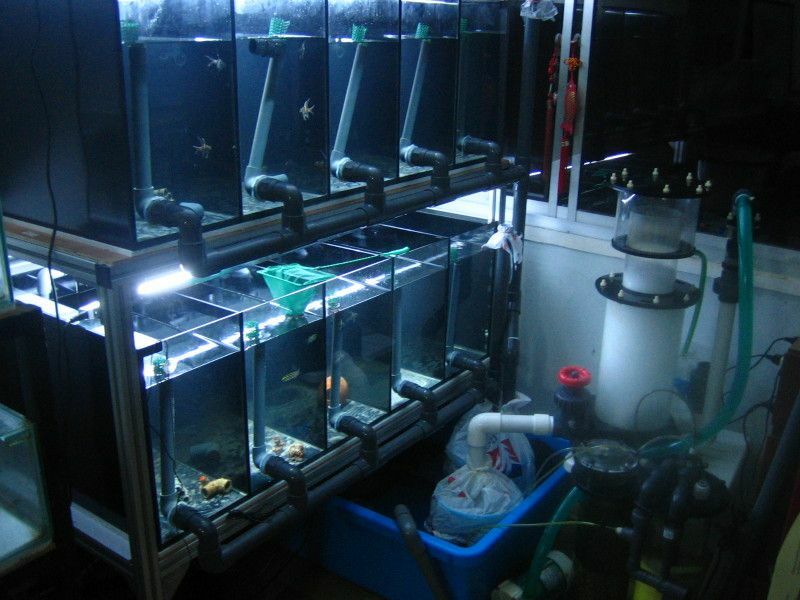 eldouble wrote: Is anyone using a refugium for macro algae or/with a deep sand bed. I have a fuge on my 90 gallon reef tank, for nutrient export along with a skimmer. I still have to do weekly water changes due to fish load. I see this being 10 times worse as ar as nitrate issues. Im steadily at 30 right now, but with 1000 hungry kids, I would guess nitrates should hit the roof. I understand fish can handle higer nitrates than inverts and corals, but I still think 100 is way to high. How does everyone handle nitrate removal? might have to frequent your water changes more if youre having high nitrate issues. im not sure of another safe way to do so but im no expert, plus constant water cycling can get damn expensive.. I don't know why I don't have high nitrates. I siphon almost daily, and all water goes thru a 100 micron filter, changed daily. I've been doing this for over a year now, with 400-1000 small fish in about 130 ish gallons in my big system, just as many in about 90 gallons in my smaller system, and still nitrates are 10 at the worst. I do regular waterchages, too. I think it is the regular removal of solid waste that saves me, as well as the water changes, which on such small systems are not that expensive or difficult to do. I still think I should have high nitrates, because all these fish are peeing, too, and I am not removing that! I feed them 4x per day, so there is some waste being produced. Clownfish75 wrote: I use alage scrubbers, work like a charm. What are algae srcubbers ? The fuge is an offshoot of the algae scrubber concept. Basically, the algae scrubber is a shallow layer of watter flowing over a long, well lite surface. The surface is planted with a variety of macro algae. the long exposure of the water to the photosynthetic organisms strips the water of most phosphorous compounds and nitrogenous wastes. The concept was used heavily by Walter Addy at the Smithsonian Institute in several of their experimental and display reef systems. The intent was to replace skimmers. The problem was in lowmolecular weight proteins that were not removes. They added so much color to the water that light penetration was impaired. I believe that they ultimately resorted to O3. I don't know what the systems look like today. Lqst time I was up there was 2000.
and the book that started the craze. Yes, basically you are correct. But benificial algae, like calerpa can grow there as well. Remember, in my mind as an aquatic biologist, those nusance species are also macroalgae. This contrasted with the many micro algae species, single cell and colonial. Follow the references. If needed, I'll post more links. The systems are pretty simple to build. As christian stated, they are quite effective for breeding systems. Reef systems, I have some doubts. But that subject is always open to debate and I am always willing to listen and learn. The second edition adds new concepts that make the concept a bit more practicle. I just remember the problems we were working with in the smithsonian reef display. But that was an enormous closed system reef display for the time. Technology has advanced ten fold since the late 90's. If you closely in the second picture I linked you'll see a white plastic drum behind the row of tanks. That's our 55 gallon RDSB that has close to 26in of play sand in it. Dropped our nitrates from close to 300 to about 60ppm. After writing the post i actually realised that nusance algaes are also macro algaes . So i guess its just like a fuge with a high surface area for algaes to grow on. ive recently worked on a cheato fuge which i thought would be really successful and removing nutrients but other nusance algaes are out competing the cheato. Here is a 1 min vid of it in action. What I've been busy with. The tank is divided into 5 compartments using black tinted glass. The back, bottom and sides of the tank are covered with black oyama paper. Standpipes are located at the front. I think each compartment should be able to double up as a larval rearing tank. The tank stand is made of aluminium alloy. The normal output T5 fixture you see on the "table", will be lighting for the broodstock. It will be mouted on the wall, and it doesnt need a ballast (don't ask me why, I'm puzzled as well). Multiple fixtures can be fixed next to each other, rather like lego, and powered up by a single 2-pin plug. Best thing is, the 4 ft light fixture cost me less than US $11 brand new. As for the oversized UV, just say I have a very big phobia of ich and velvet. The sump is a 4ftx2ft tub. Cheap and good. Will post another pic once I get the system up and running, hopefully before 2008.
chris melb wrote: After writing the post i actually realised that nusance algaes are also macro algaes . So i guess its just like a fuge with a high surface area for algaes to grow on. ive recently worked on a cheato fuge which i thought would be really successful and removing nutrients but other nusance algaes are out competing the cheato. If the point is nutrient export, is there really such a thing as 'nuisance' algae? 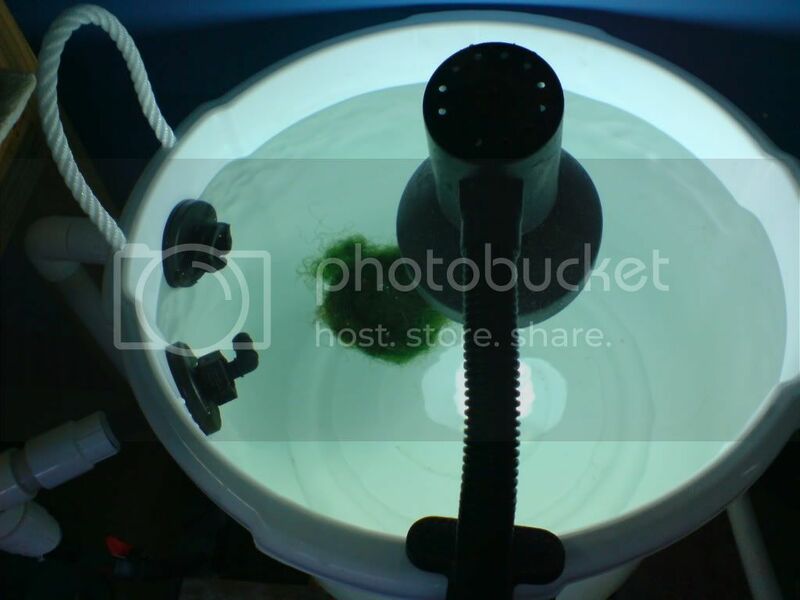 You can harvest briopsys just as well as Chaetomorpha and export nutirent. FuEl wrote: Will post another pic once I get the system up and running, hopefully before 2008.